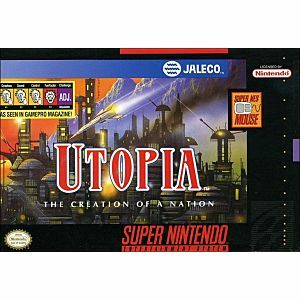 Utopia: The Creation of a Nation for Super Nintendo allows you to Use 34 different building types to cover the terrains of the various planets, accounting for unique atmospheric hazards along the way. Attacking alien life forms will make your task all the more difficult, as you to try to civilize each of the planets. Plan, develop, allocate funds, and establish trade in your efforts to create 10 separate societies across the universe.